Garlic Chives are also known as Chinese Chives or Kau Tsoi. They prefer a sunny position in moist but well drained soils. 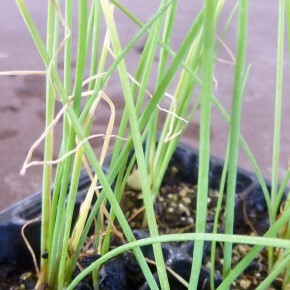 Harvest Garlic Chives often by cutting off about 3cm above soil level. It is recommended that you divide the clumps every 2 years to improve the vigour of your Garlic Chives. Pink flowers appear on common Chives wheras Garlic Chives have white flowers. The essential oils in Chives have anti-fungal and insecticide properties, so they can be used as companion plants for vegetables, fruit and roses that are vulnerable to aphids. Garlic Chives are used chopped in sauces, soups, salads and as a garnish.